Hytrex cartridge filters are made from thermally welded blown microfibers of polypropylene. These microfibers create a strong, secure cartridge that captures particles throughout the entire filter depth. This translates to longer life and fewer change-outs than existing string-wound or resin-bonded filters. Hytrex’s true-graded density filter matrix combines efficiency, long life and purity to create a high performance depth filter. 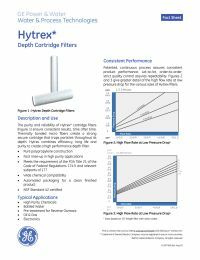 The purity and reliability of Hytrex cartridge filters ensure consistent results, time after time.